The good times are over! Where previously, companies could gain market approval for their medical product and pass it on to marketing to sell, there are now requirements: continued clinical benefit, strong economic value, and physician/patient acceptance in real-world use. These three sectors are now the pillars of evidence on which sales success is built. Success is in the eye of the beholder. The manufacturer wishes to develop their reputation and revenue stream. Physicians desire usability and reliability. Patients want safety, comfort, and security—minimizing risk and maximizing outcomes. Payers prioritize the cost to benefit ratio for a population. To be successful, medical device companies need to ensure that all groups are happy and advocates of their product. Targeting the right people and identifying their concerns and needs are essential. 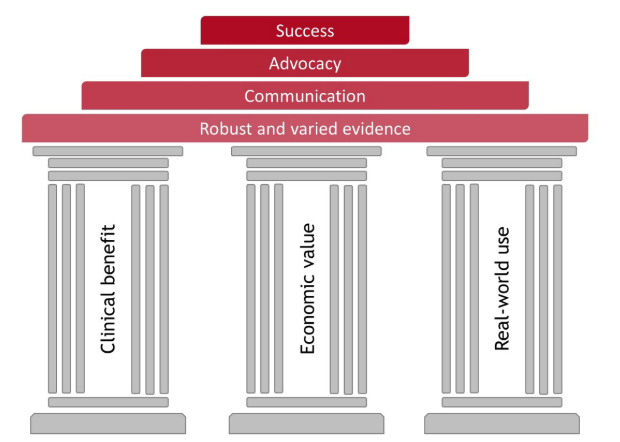 Winning advocacy for your medical device requires excellent real-world experience and appropriate communication: academic and scientific channels for physicians and payers; (social) media for patients. Successful communication is built upon robust and beneficial evidence. Planning is critical to ensure that the outcomes assessed resonate with payers, target physicians, patients, and health authorities alike. Companies can continue to activate their evidence by using single studies in multiple ways to generate new publications and value. Meta-analyses and health economic modelling of trials are examples to consider to help in obtaining reimbursement and to generate lasting sales prospects.